I think I’ve said it before, but I have a bit of a soft spot for British food. And not, like, the new kind, that Marco Pierre White-inspired next generation British cuisine, the stuff of Jamie Oliver and Nigella Lawson. I mean, like, BRITISH food. Sausages and potatoes. Stuff where herring features prominently. Dishes composed of varied shades of beige. I like gravy. British food is all about gravy. Carbs and gravy. Gravy carbs. It’s a bitter, bitter shame that when I actually went to England, I was still in the throes of my picky-eater stage, which lasted from sometime after I started solid foods until I was about 22, and included a confusing period where I didn’t eat red meat for texture reasons. I suppose if I were to really think about my life, my biggest regret would be all those years when my metabolism was at its peak and I was just squandering my advantage. Fortunately I’ve always been fish-positive, and when I went to England I ate a lot of seafood. Even though I have good reason to believe I have a mild shellfish allergy, I would endure the consequences and sidle up to the table for another round again and again. I’d rather have shellfish plus consequences (and a slightly shortened life expectancy) than no fish and shellfish at all. A couple of years ago, a book fell into my collection that I have come to refer to at least once per month. The living room in our apartment has a window that juts out a bit from the building, and when it rains the water pounds the glass and it’s quite loud; on afternoons when the rain pours and pounds (often) and Toddler’s down for his nap, sometimes I like to read my book in the chair beside the window and imagine a busy fish market in England and being treated to a plate of kedgeree made by somebody else. 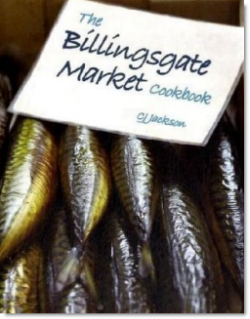 I’m talking about The Billingsgate Market Cookbook. Situated in the heart of London’s Docklands, the frenetic pace and historical kudos of the market are more than a match for the financial institutions that surround it. Although the unassuming building sits squatly in the shadows of its impressive high-rise neighbours, the bland facade only serves to belie what’s going on side. Here, shirts and ties are swapped for Wellington boots and aprons, and city lingo takes a back seat to market banter. Sounds fun. Don’t you want to go to there? For now, because I’m thinking of kedgeree because it’s looking like another night of rain, here’s a recipe. It calls for “smoked fish;” I usually grab a tin (or a couple if the store only has small tins) of smoked mackerel, which you generally get in the same place your store stocks its canned tuna. It’s cheap, and it’s actually really good for you, with it’s DHA and calcium. If it’s cold where you are, make it tomorrow. It’ll warm your bones. Using a saucepan with a tight-fitting lid, bring the rice with the turmeric to a boil in three cups of water. Turn on the lid, reduce the heat to low, and cook for 20 minutes, not removing the lid until 20 minutes has passed. If you’re using fish that hasn’t been cooked, poach it in milk for three to four minutes until it’s cooked through and opaque. If you’re using canned fish, put the milk away and skip this step. Melt butter in a large pan, and add the curry, ginger, chilies, and onion. Cook over medium heat, stirring frequently, for three to four minutes, until the onions have softened. Add the rice, and stir together until the rice is well mixed. Using your fingers, break the fish into chunks and add it directly to the pan. Taste, and adjust seasonings as needed. I like to serve this topped with a runny-yolked fried or poached egg; try it. You’ll like it, I promise.